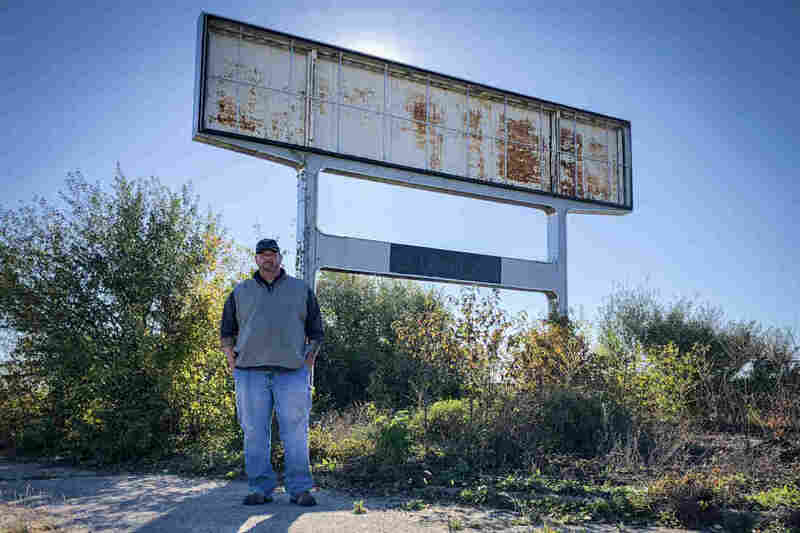 Life After GM: A Family Upended By Auto Plant Closure Took Divergent Paths Ten years after the financial crisis, the recovery hasn't reached everywhere. After the plant at which they worked was shuttered, three members of a family saw their lives change in unexpected ways. Don Skidmore stands in front of a sign for United Auto Workers Local 735, the union chapter he represented as president when he was a General Motors employee. After more than three decades working 50- and 60-hour weeks at the plant, Don Skidmore is still adjusting. These days, he spends his time on the golf course. But Skidmore's not retired. The golf course is where he works. For the last two seasons, he's helped operate the fleet of sprayers, tractors and mowers needed to maintain an 18-hole course. Skidmore likes this work, but it isn't where he imagined himself at 60. He still misses the old days of building transmissions at the Willow Run GM plant in Ypsilanti, Mich. His wife and stepson also worked at the plant. But that ended with the collapse of the auto industry in the Great Recession. The aftermath sent them on different paths through the recovery. Ten years later, the national unemployment rate is lower than it's been in nearly a half-century — 3.7 percent. In Michigan, unemployment is at 4 percent. That's a huge turnaround from the depths of the last economic downturn, when the rate reached nearly 15 percent. But those figures don't tell the whole story. For people like Skidmore, he's still making less money than he did when he was working at GM. He's an example of the sluggish wage growth that has marked the recovery. For Skidmore, it meant taking a seasonal job doing maintenance on a golf course. Between that and his GM pension, he still makes less money than he did at the auto plant, where overtime and weekend shifts brought in extra income. And all these years later, the closure of Willow Run is still painful. Just thinking about it makes him feel sick. "Just the word or to see it on the freeway ...," Skidmore says. "It was a lot. It was everything." When he started worked here in the 1970s, he says, the plant employed 15,000 people. During World War II, the plant pumped out bomber planes, more than one an hour. Willow Run helped fuel Detroit's reputation as the arsenal of democracy. Rosie the Riveter originated here. 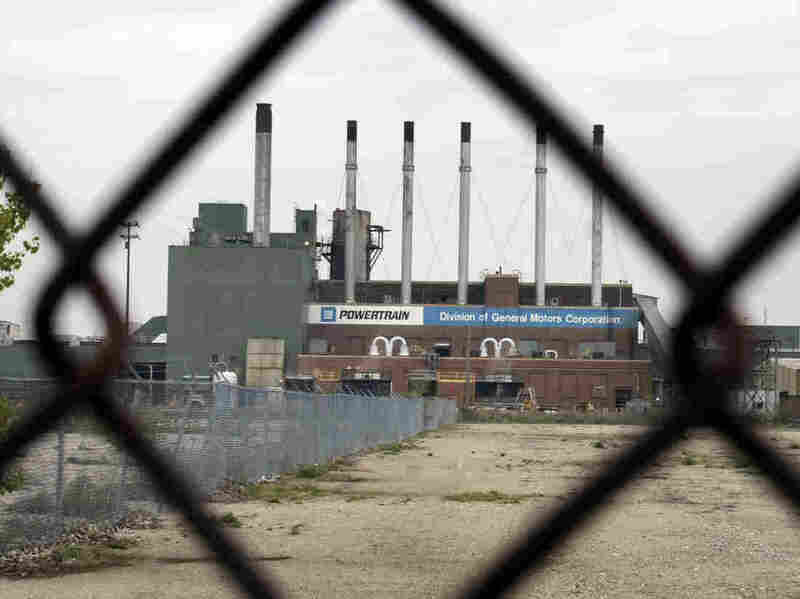 The General Motors Willow Run powertrain plant in Ypsilanti, Mich., in 2009. The plant, which had employed thousands at its peak, closed the following year. By the end of 2010, only 1,000 people were left at the plant. And when Willow Run closed, Skidmore was one of the last people to leave, because he was the local president of the union there. It was Christmas 2010. "It was dark and scary and crying all the way to the car," Skidmore says. "Like losing somebody. Like losing your life, you know?" At the time, he lived with his wife and stepson. The paths that each of them have taken since then reflect larger patterns in the U.S. workforce. Skidmore wasn't quite ready to retire, so he went to a different GM plant in Toledo, Ohio, for a few years. That commute was an hour's drive each way. Finally, he took a buyout in 2016. Now, he gets paid to ride a lawnmower for hours, combing 18 holes for errant weeds or grass patches in need of trimming. And that gives him time to think — a lot of times about the auto industry. 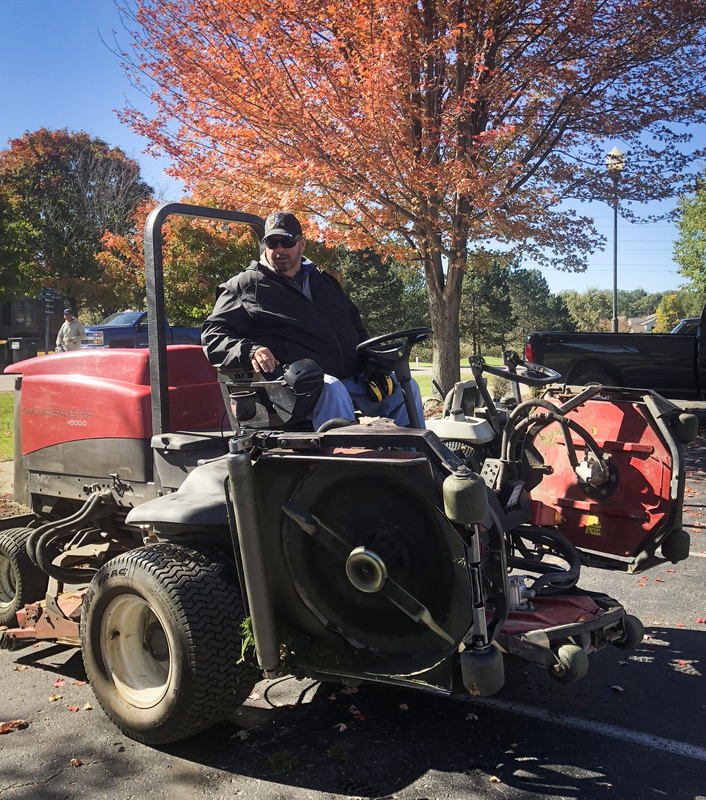 Don Skidmore likes his work maintaining a golf course, but it isn't where he imagined himself at age 60. "I think I made the best of the situation," Skidmore says. "I'm not happy. Still not happy. Still miss the people. Still miss my job representing people. It was great. And then General Motors just bam, they shut the door and we all go our separate ways." Back then, Skidmore was married to Dawn Green, who also worked at Willow Run in a variety of jobs like machining and heat treatment. But when the plant closed, Green left the industry for good. She learned that GM would cover most of her tuition to go back to school, so she spent more than four years training to be a nurse. Once she was in class, Green says, she noticed "how different it was actually really going to be, because there were people who'd just graduated high school that were there with me." Today, at age 45, she is a nurse at an urgent care clinic, tackling everything from stitches to flu shots. Dawn Green is a nurse at an urgent care clinic. After leaving Willow Run, she learned that GM would cover most of her tuition to go back to school, so she spent more than four years training to be a nurse. She loves her job. But for Green, the scars of the economic crash weren't just financial. Amid the tumult of Willow Run's closure, Skidmore and Green's marriage fell apart. "I, at that point, was used to being independent, used to being able to depend on myself and pay my own bills," she says. "And once that wasn't there anymore, I felt like I had to depend on him. 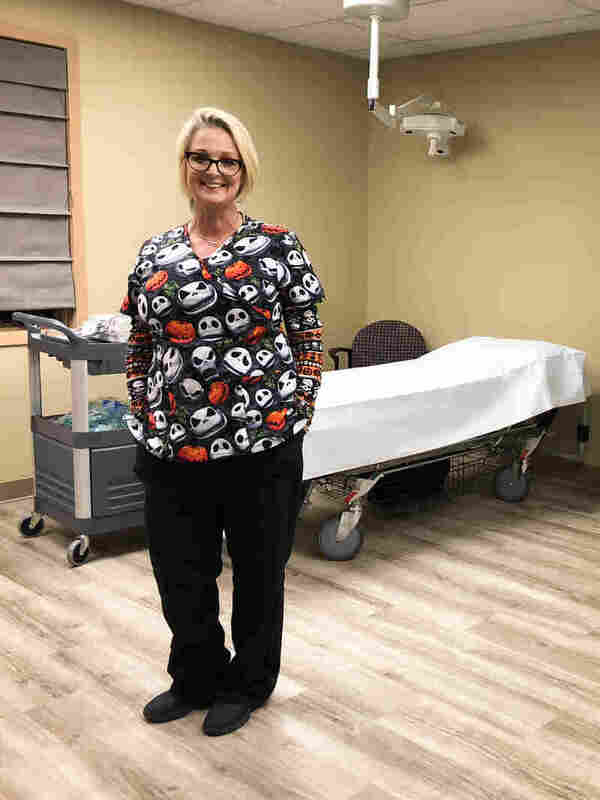 I think I was searching for that independence again and just couldn't handle it, so ... ."
Among her former colleagues from Willow Run, Green's trajectory back to school and into a skilled job is rare, she says. She often sees people she knew from the plant — many of whom have passed retirement age — working service-sector jobs in shops and restaurants around town. "I don't know if that's exactly what they pictured life being like after retirement," Green says. "It gets me kind of emotional, to be honest. I guess I always assumed that when you retired, you retired and you enjoyed your life after that." Some people who worked at Willow Run weren't old enough to retire 10 years ago — like Green's son, Nick Patton. 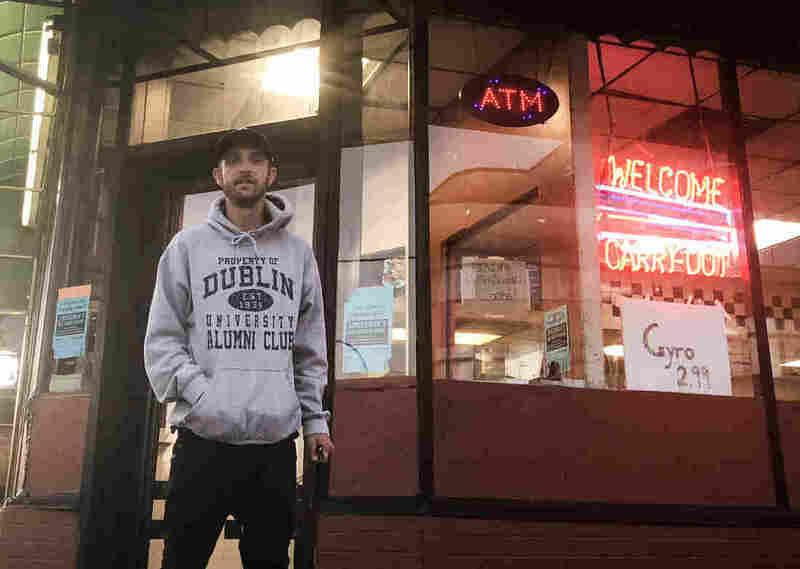 At 29, he's part of a generation that entered the workforce just as the recession was hitting. Many have never found their footing. Patton started working as a cleaner at Willow Run on the midnight shift. He was 18. And he held that job just a few years until the plant shut down. "It was like a tease, really," he says. "Here's a good job. You're going to be set. You don't have to worry about getting thousands of dollars in debt for student loans and doing all this. You can just work hard here and in 25, 30 years, retire and just live a normal life. But that was not the case. It went down the drain a little bit." Nick Patton, Dawn Green's son, has struggled since leaving Willow Run. Like many who entered the workforce during the recession, he has struggled to find his footing. Patton has struggled since he left Willow Run. He's been in and out of school and service industry jobs. He moved to Florida for school and then came back. He recently got a job with a rental car company at the airport, but until he starts, he's picking up seasonal work at a haunted thrill park. Every weekend night, Patton suits up in a costume with seaweed dripping off a snaggletoothed face. The job is fun, he says, but it's not the kind of career he pictured for himself. A decade after the economic crash, the three former GM workers each has a job. But they're all making less money than what they did at Willow Run. Charley Ballard, a professor of economics at Michigan State University, says that while the unemployment rate is relatively low, below the surface, there are signs many people have been left out of the recovery. "Sluggish wages for the middle and bottom and rising inequality is a national story," Ballard says. "Michigan is a lot like many other parts of the country." In Michigan, many of these trends can be traced in part to the decline in manufacturing. The state's economy is diversifying, adding jobs in technology and other sectors. And workers with only high-school diplomas don't have the training and education to match those needs. The Willow Run site is an example of that change. The site of the former plant is now home to the American Center for Mobility, where companies test self-driving cars on simulated highways and city streets. Skidmore hadn't been on the property since he left almost a decade ago. On a recent tour there, he seems uncomfortable revisiting his past. Rusting GM security towers still stand guard and pieces of the plant's old brick floor remain. "It seems like a fantasy world or something in here," Skidmore says. At the plant's old front entrance, he gets out of the car and stands on the ground and remembers times that he led GM picket lines. He reminisces about traffic jams and honking horns on the same stretch of land where the auto industry is now experimenting with driverless cars. "Now cars are driving themselves," he says. "What a crazy world." A big sign looms over his head. The GM logo is long gone. But on the crossbar underneath, in faded black paint, you can barely make out the ghost of another logo: United Auto Workers, and the name of the union chapter that Skidmore represented — Local 735.